A life-size statue of Jane Austen will be installed in Bath, where the author lived with her parents at various addresses between 1801 and 1806. 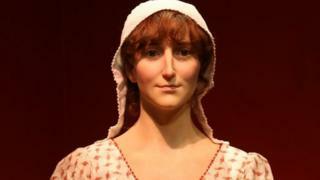 The Jane Austen Centre said the bronze statue would be based on a waxwork unveiled in 2014, which is believed to be a very close likeness. Managing director Paul Crossey said it was "fitting that Jane Austen should be honoured in the city". The exact location of the statue is currently under discussion. Several possible sites in the north of the city, relevant to Ms Austen's life and writing, have been identified. "It will also be good to go a little way to redress the fact that less than 3% of all statues in the UK are of historical, non-royal women," said Mr Crossey. Jane Austen's parents were married in the city, at St Swithin's Church in Walcot, in 1764 and on George Austen's retirement from his rectory in Hampshire, they moved permanently to Bath.